It used to be, when there was a threat to Earthrealm, that Raiden would rally the Forces of Light to face the enemy in Mortal Kombat. Somehow he could always discover the truth behind the deception. I was one of his allies and fought with him against the Forces of Darkness. In those early days Liu Kang was the point man, he was the star. The rest of us played supporting roles, clearing the way so he could take on the main threat. But times have changed. Raiden has abandoned us. He's become darker, using more ruthless ways to keep the "peace." And Liu Kang was killed. Though his spirit is still around to help us, eventually he'll pass on into the Heavens. It seems like we have no clear leader. We're just not the fighting force we once were. We're scattered all over the realms. Maybe it's because there hasn't been a real threat since we took care of the Dragon King, I don't know. But I can't help but feel uneasy about the future. I used to think, "What if there's a new threat? Who's gonna lead us?" With Raiden gone, how would we even tell when something bad is about to happen? The answer came soon enough. I started having visions of someone we had defeated years ago: I saw the Fallen Elder God Shinnok plotting something and I decided to find out what. In my visions I could see Shinnok in different locations, conjuring these communication portals to give orders, which I couldn't quite understand, to his minions. I followed him, finding each place I saw in my visions, and always there was evidence that he had in fact been there. My visions weren't dreams after all. Shinnok was back! In my last vision, I clearly heard Shinnok say the next place he was going to contact his minion from was Shang Tsung's island fortress. That place has played a big part in the fight between good and evil. It seemed fitting that I would confront Shinnok there. When he finally showed up, I watched him for a while, to try to get some idea as to what he was planning. Was I surprised to see that the "minion" in the portal was Quan Chi! Shinnok ordered him to gather the Forces of Darkness and retake Shao Kahn's fortress in Outworld. When he dismissed the sorcerer, I approached Shinnok. He was startled and immediately conjured up a skeleton hand to trap me. I jumped out of the way and followed with a Shadow Kick to the chest. I pummeled him, and he never regained his composure. The coward escaped in a cloud of smoke... a teleport of some kind, I suppose. 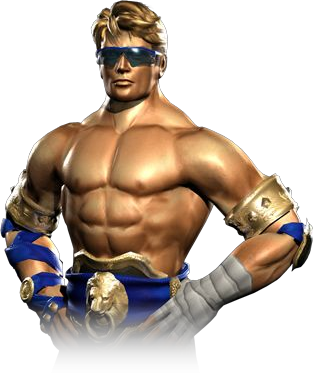 I seem to have discovered the next great threat to Earthrealm. Now I need to find the others. I'll need their help if I'm going to defeat Shinnok's forces. 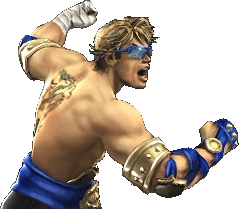 The fate of Earthrealm depends on me. 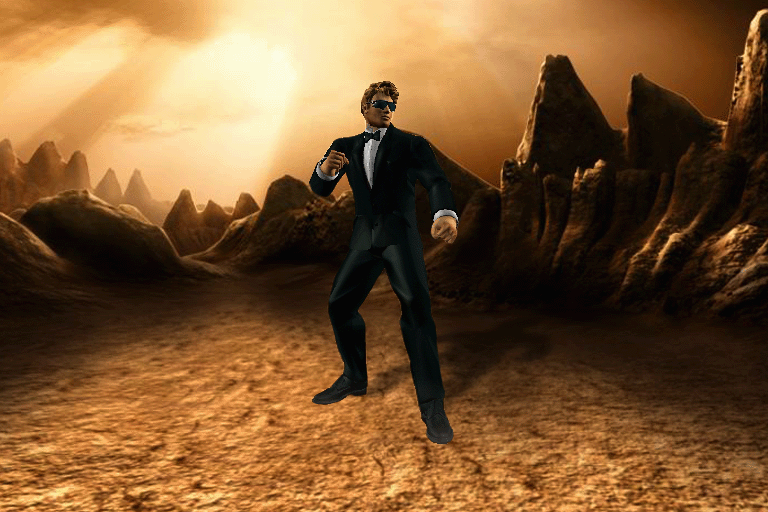 Johnny Cage defeated Blaze, and the power of the gods rushed through him. He gained superior strength and dexterity, but more important, a new insight into his existence. With the help of Shaolin masters, he renounced his superficial former life and became enlightened.